Conductor Christopher Wilkins will preside, as the Boston Landmarks Orchestra launches its 11th consecutive season of free concerts on the Esplanade this Wednesday, July 19 at 7 pm with a lively mix: Ralph Vaughan Williams’s English Folk Song Suite, Delius’s Summer Evening, Peggy Stuart Coolidge’s The Blue Planet, Samuel Barber’s Knoxville: Summer of 1915 (with of soprano Sonja DuToit Tengblad), Verdi’s “Winter” and “Summer” from I vespri siciliani, and Elgar’s Enigma Variations. How much does the programming change from year to year? Wilkins: We continue to play a combination of great works and more recent ones, and there is a great variety in our repertoire. Each season features several premieres, most designed to invite community participation. We look to create a mix that appeals broadly, including to people for whom classical music is not a part of their regular diet. So yes, some tried-and-true, but never business-as-usual. We’re also aware of being part of a long tradition in Boston. The Hatch Shell’s site on the Esplanade was originally established for Arthur Fiedler, with an orchestra he formed called the Esplanade Symphony Orchestra. It then became a regular summer venue for the Boston Pops where, following Fiedler, John Williams, and Keith Lockhart regularly led concerts. The Boston Pops discontinued their regular concerts at the Hatch Shell in 2004, the one exception being the Fourth of July. So the Boston Landmarks Orchestra now fills what otherwise would be a major hole. 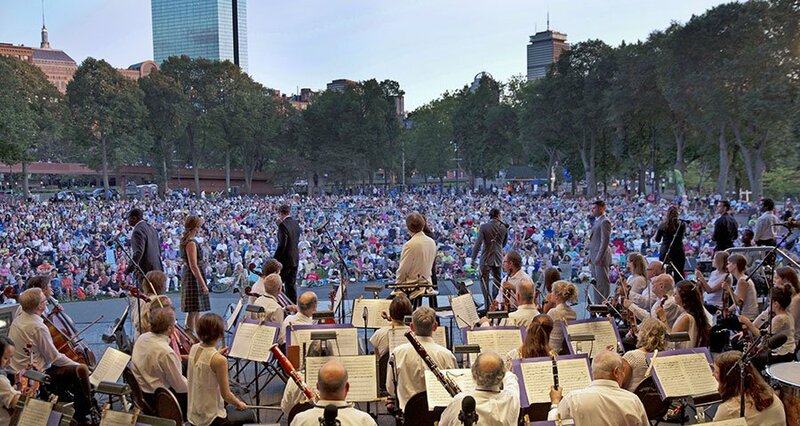 We are the only professional orchestra regularly performing in Boston in the summertime. The Esplanade has traditionally been the place where Bostonians of all backgrounds can come together to enjoy great orchestral music. It’s not a coincidence that Leonard Bernstein made his professional conducting debut at the Hatch Shell. Unlike the Boston Pops in recent years, you perform major works in their entities. We do, and we always have. It’s such an appealing venue for listening to music; there’s no reason why it’s not a perfect place to hear a Dvořák symphony for the first time, or to hear the complete Beethoven Ninth, which we play on August 2nd with the Back Bay Chorale and our One City Choir. When the weather is right, the cheeseboard and thermos are full, and the orchestra’s playing, there’s no need to rush things. A full-length symphony, it seems to me, works as perfectly out there on the Esplanade as a Sousa march! You mentioned the One City Choir. That’s become something of a signature endeavor for the orchestra, hasn’t it? It certainly has. We established it as a means of including singers from every neighborhood of Boston in our performances. They come together for this one occasion, singing together for the first time, and they do so as representatives of our diverse city. The Back Bay Chorale—and their gifted Music Director Scott Allen Jarrett—form the backbone of the ensemble. This year they’ll perform the Beethoven Ninth Symphony, which, with its message of universal brotherhood, is an ideal work for a chorus representing community. The One City Choir has always been popular—but this year especially so: there is a long waiting list to join. And we have several other projects with similar community-minded aims. In the final week of the season, we’ll present an evening called Dance Carnival. For that, we’ve invited dance groups of different genres—Irish, salsa, and so forth—to represent different aspects of dance in our community. For the grand finale that night, Peter DiMuro—Executive Director of the Dance Complex—is creating original choreography to Copland’s Rodeo. He calls the dance work, Pioneers. In it, he will explore the idea of innovation. In that production we are so pleased to welcome—for the first time with us—Boston Ballet II, the pre-professional training program of Boston Ballet. The new works you have present over the years seem to embrace a variety of styles. Can you tell us about the work you have commissioned this summer? Two composers celebrate residencies this year: Gonzalo Grau and Ryan Edwards. Each will spend several weeks with young people—in Gonzalo’s case several months—creating, writing, orchestrating, and improvising with the kids. What’s unusual about the Landmarks approach is that we not only perform for young people, and invite them to participate in pre-concert workshops, but we also create ways for them to perform with us, in front of thousands of people on the night of the concert. It’s tricky to accomplish, but it’s one of the most exciting things we do. Gonzalo is working with four extraordinary young musicians at Zumix in East Boston. The kids have composed the piece with expert guidance from Gonzalo. He has created the orchestrations, and found a way to weave their ideas into an organic whole. I threw out the theme of “identity” to them in keeping with the evening’s theme, Anthems of the World. They responded with the idea that identity is all about perspective, and so they call their new work, Views. It will premiere on August 9th. Then with Camp Harbor View and the Boys and Girls Clubs of Mattapan and Roxbury, Ryan Edwards is working with dozens of young people to create an original work for our final concert, the dance night. He’ll lead about 50 drummers in a work he has co-created with one of his former composition teachers at Berklee, Apostolos Paraskevas. As he did last year, Brian Mirage will teach dance and movement to dozens of other campers. Last year’s collaboration was—in terms of quality relative to mission—one of the finest things we’ve ever done. I look forward to this year’s edition greatly. Another commissioned work I’m very excited about is Kareem Roustom’s. I asked Kareem if he would create something related to his home country of Syria. He told me that Aleppo—so much in the news these days— is “the most musical city in Syria.” He’s created a three-movement work called Aleppo Songs, based on traditional and popular music of that city. It will thrill people, no doubt. We’re lucky to have Kareem in our community. His setting of the Armenian Dances we performed last year with the Sayat Nova Dance Company was a major highlight of the season. You are hosting two guest orchestras this year, one of which is new to the series. Yes. We have presented the Longwood Symphony every year since we’ve been on the Esplanade, but Longwood has a much longer history of performing at the Hatch Shell than that. We consider them a sister organization, since they are so focused on community service. We also identify strongly with their mission of relating music making to healing. We are also very excited this year to present the Mercury Orchestra under their Music Director, Channing Yu. Channing has done an amazing job of putting together a top-rank orchestra of volunteers over the past few summers. His programming is always ambitious and exciting, typically with an emphasis on operatic literature. Their Hatch Shell program includes music from two well-known operas, both magnificent and opulent scores: Strauss’s Der Rosenkavalier Suite and an orchestral suite made up of great moments from Wagner’s Die Meistersinger. You always find ways to collaborate with schools and music camps. Tell us about some of those. That’s right, it’s a regular and important feature of each season for us. We have collaborated with the Conservatory Lab Charter School—one of Boston’s El Sistema-based charter schools—since I began seven years ago. This year they will perform on our final week in the Emperor Waltzes of Johann Strauss, Jr. And this year, for the first time, we are working with the marvelous young musicians of the Boston String Academy in what has become a standard work of Latin American music, the Márquez Danzón No. 2. On Opening Night, we’re thrilled to welcome back the Boston University Tanglewood Institute. Student brass and wind quintets will perform immediately prior to the orchestra concert. They will perform from 6:15 to 6:45. The Boston University Tanglewood Institute is, of course, an elite and acclaimed institution. It was very important to me in my formative years at Tanglewood. And finally, in addition to the performers from BUTI, tell us what we can expect on Opening Night. Opening Night is our annual ‘Green’ concert. We will host more than a dozen environmental organizations that night. They’ll be stationed at tables and tents around the Oval to let people know of the great work they’re doing, and to solicit support from those in attendance. The orchestra and I will perform music related to the out-of-doors, nature, the seasons, and the idea that summer is a time for coming together with family and friends. The program includes Delius’ Summer Evening and Barber’s vocal masterpiece Knoxville: Summer of 1915. 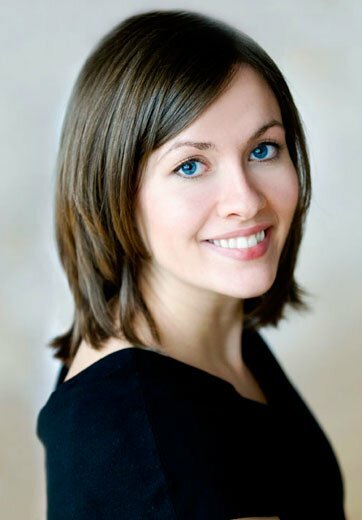 The soprano soloist will be one of the stars of the Boston musical scene, Sonia DuToit Tengblad. We will also perform a work by Peggy Stuart Coolidge, The Blue Planet. Some will recall that last summer we performed Isabella, a musical portrait of Isabella Stewart Gardner, in our collaborative evening with the Gardner Museum. Peggy Coolidge was a prominent composer (writing half a dozen works for Arthur Fiedler and the Boston Pops), pianist (she soloed with the Pops), and conductor in Boston in the mid-20th century. Despite all of that, it’s not a well-known name. Certainly things were infinitely more difficult for women composers than for men in those days—and it’s still true—but it’s nonetheless hard to understand why her name is not better remembered today. We’re excited to help promote her music. Finally, the concert will conclude with Elgar’s Enigma Variations, one of the most sumptuous and brilliantly orchestrated works in the repertoire. Elgar wrote it to honor his closest friends and family, including his wife Alice. One of the 14 variations is the famous ‘Nimrod’, composed for his publisher and dearest friend. It pays homage to the great adagios of Beethoven. No music touches the heart more deeply, or is filled with more love. Christopher Wilkins was appointed Music Director of the Boston Landmarks Orchestra in the spring of 2011. Since then the orchestra has helped reaffirmed founder Charles Ansbacher’s vision of making great music accessible to the whole community.